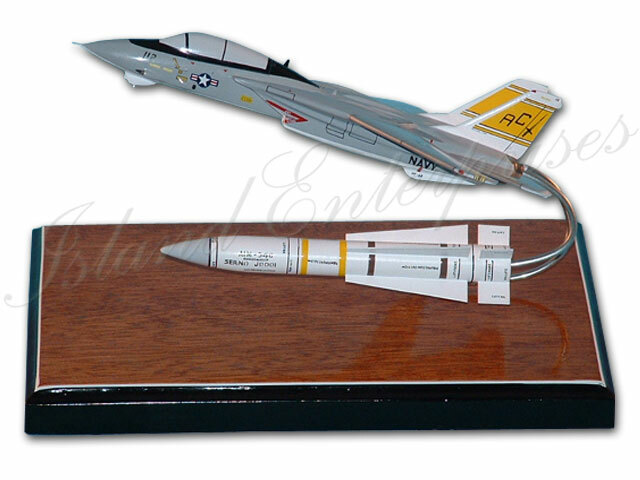 This is one of our 8" miniature F-14 "TomCat" models straddling a 6" AIM-54 missile, on a base. This was a special project a couple of years ago during the "Last Sunset" event, the deactivating of the last F-14 squadron. Customized the model with any paint scheme and markings. You may also switch the AIM-54 for any other missile, bomb, pod, or other object you desire. And you can customize the base to any size or shape you want, with any carved and painted text or patch, as well. AND REMEMBER!!! We offer a 100% money back guarantee if you are not totally convinced you have bought the best product available on the market! !